A team of students from the University of Hawaii College of Engineering and the School of Architecture captured the top prize in the UH Pacific Asian Center for Entrepreneurship (PACE) Breakthrough Innovation Challenge (BIC) for their Namib beetle inspired building material. Monica Umeda and Francis Newton Parks III received $1,000 for Cloud Catcher, an energy-saving, water-harvesting wall that employs hydrophilic and hydrophobic relationships to remove water from outside air and pass clean, fresh air to building occupants. Qihui Fan, Wenqi Hu and Aaron Ohta from the College of Engineering took second place and received $500 for their human cell and cellular microenvironment-inspired organ assembly technology. The team showcased their research and development of a microbubble robot system that assembles single living cells to form tissues and organs outside of the body. Finally, Electrical Engineering student Jon White took third place and received $250 for Fly-Sailing, a basilisk lizard inspired hydrofoiling catamaran. PACE again focused this year’s BIC on Biomimicry. Students and faculty were asked to submit innovative solutions that mimic nature to solve human problems. In the qualifying round, challengers submitted two-minute videos via YouTube describing how their innovation emulates nature and its market opportunity. The video submissions were viewed and ranked by a preliminary round of judges. The finalists were announced and paired with a mentor to prepare them for the last phase, where they presented their ideas and its commercial potential to a final judging panel on November 7. The Challenge is organized by PACE, in partnership with the UH College of Engineering, the College of Natural Sciences and the William S. Richardson School of Law. 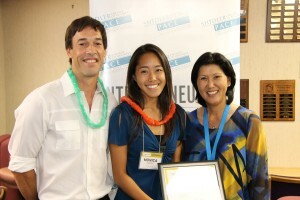 For more information, visit pace.shidler.hawaii.edu/bic.